Out of the office and into a tree – come work with Transport Canberra and City Services! 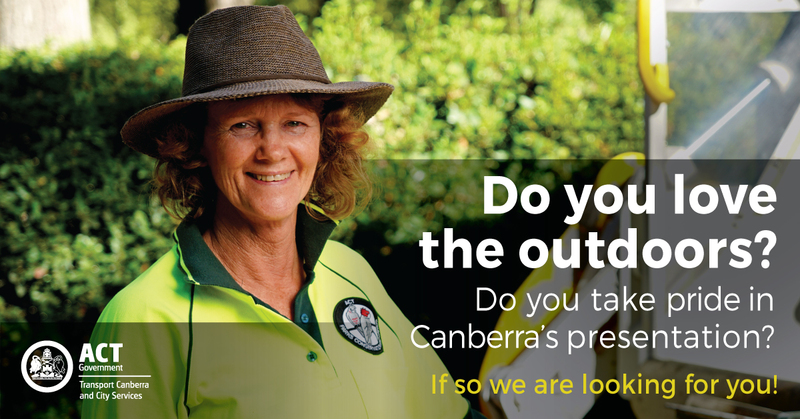 Transport Canberra and City Services (TCCS) are looking for new recruits who are passionate about Canberra’s urban forest and enjoy working in the outdoors to join their City Presentation team as a Tree Worker. The City Presentation branch is responsible for the planning, management and maintenance of parks and the public domain which includes lakes, public open spaces, city places and street and parkland trees. It maintains the look of the city and its surroundings. “As Canberrans we are passionate about our bush capital and keeping our city looking its best. At Transport Canberra and City Services we are integral to ensuring our city remains one of the most liveable cities in the world,” said Manager of Urban Treescapes, Rachael Dawes. TCCS are an equal opportunity employer and are committed to building a culturally diverse workforce and inclusive workplace. Women and people from an Aboriginal or Torres Strait Islander background are strongly encouraged to apply. “If this sounds like a role you’d enjoy, come along to a ‘Come and Try Day’ where you’ll have an opportunity to get on the tools and have a go at activities typically performed in these roles such as tree pruning, chipper and chainsaw operation and going up in an elevated work platform. Members of the Urban Treescapes team will be there on the day and can answer your questions about working at TCCS including working conditions, benefits and training and development opportunities. “This is a great opportunity to pull out your green thumbs and contribute to Canberra’s urban forest, ensuring it continues to contribute to Canberra being an attractive and safe city. I encourage anyone interested in these opportunities to come along on Thursday, 15 November 2018 and have a go,” Ms Dawes concluded. Applications are open now and close on 22 November 2018. More information is available online at www.jobs.act.gov.au. Where: Dickson Depot, 94 Hawdon Street Dickson (opposite the intersection with Dumaresq Street).